Erythrasma is a bacterial infection that affects the skin. It usually appears in the folds of the skin. It’s more commonly seen in warm or humid climates, and is usually caused by the bacteria Corynebacterium minutissimum. Erythrasma tends to be a chronic or long-term skin condition. 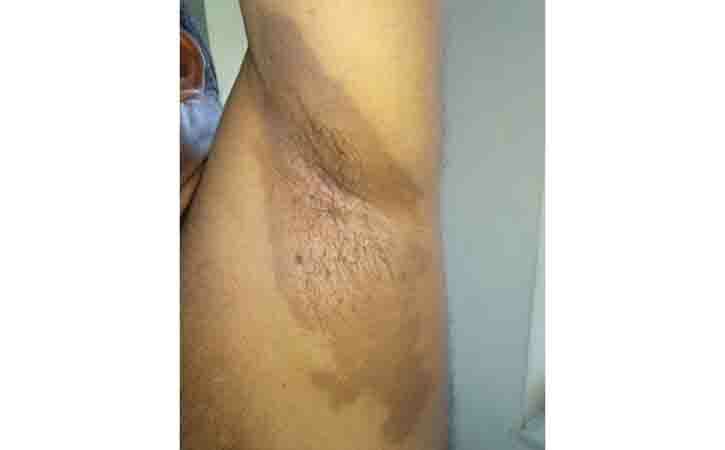 Erythrasma is a chronic superficial infection of the intertriginous areas of the skin. The incriminated organism is Corynebacterium minutissimum, which usually is present as a normal human skin inhabitant. In diabetics, larger areas of the trunk may be involved. Analyze is helped by the fact that these areas also fluoresce coral pink with Wood’s light. The most common symptoms of erythrasma include pink, red, or brown skin patches with scales, and mildly itchy skin. Sometimes the skin may also be wrinkled. The patches can vary in size, and usually start as a pink or red color. Then, they become brown and scaly. The patches typically appear in the folds of the skin and are more common in the groin area, armpits, or between the toes. Erythrasma have between the toes, may see fissures and scaly skin. Erythrasma can also appear in the skin folds under the breasts, between the buttocks, or around the navel. Diphtheroid Corynebacterium minutissimum, a member of the normal skin flora, is the causative agent of erythrasma. The bacteria normally live on the skin and can grow in warm, moist areas. That’s why it’s commonly found in folds of the skin. The bacterium is a lipophilic, gram-positive, non–spore-forming, aerobic, and catalase-positive diphtheroid. Corynebacterium minutissimum ferments glucose, dextrose, sucrose, maltose, and mannitol. Treatment may take two to four weeks to work. Patient may need to try a combination of treatments. Topical creams and solutions are usually used first. Oral antibiotics are added if the first treatments don’t work. Sometimes a combination of oral and topical treatments is necessary. In some cases, treating the underlying disease, like diabetes, can also help.